Hotaru's mom died in the fire on Infinity Bank, her mother's name was Keiko and she was 32 years old. 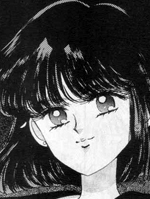 Hotaru was 8 years old at the time, she was also in the fire, she was in critical condition. When the three talismans are brought together they become the key to awaken Sailor Saturn, the last Sailor Scout from the forbidden planet and the one who must never be awakened.She is the one with the blessing of Saturn, the planet of destruction. The scout of silence and the guide to death.